A month ago I wrote about my ice skating-turned-proselytizing adventure. The post struck a chord with many of you, and I had some great conversations with folks on and offline about their views on evangelization. 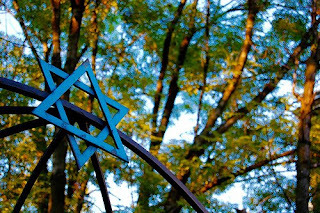 Today, I'd like to share with you my friend Rachel's perspective, informed in large part by her Jewish upbringing. I found it helpful to hear a non-Christian take on the whole discussion, so I hope you find it useful too. Thank you, Ray!! Thanks for sharing a rather personal experience on the topic in the net. I want to point out that evangelicalism is a purely Christian word. I find it queasy that it is used in the same sentence with other religions like Judaism and Islam. I do however understand what you are asking. so I'll answer it in the best of my ability. First of all, no, "evangelizing" Judaism in the way evangelicals do it (at least the way the couple did it to you) is NOT a component of Judaism. NOT AT ALL. Instead of preaching, it is doing (doing mitzvahs -- good deeds) and learning (study Torah, Talmud etc). And Jews do not actively recruit people, especially non-Jews. It's against the "good deeds" to do that in Judaism. Now, it's always a fine line, right? I mean, you've seen Jews walking about with a lulav and estrog from the Chabad movement. Yet, the first question they asked, usually to a male, is if he is Jewish. It's just their way to reinforce Jews to remember, re-learn and to actively participate in the religion, but they are not Jehovah's witnesses, knocking on every door to say welcome to our church. And, it's only the Chabad that do it somewhat -- a large sect in the orthodox movement. The one thing I love about Judaism is a sense of community, applicable structure and strong values. I find it hard to practice alone or without a family, which is why I'm not actively participating in a religious sense. But I'm active in it in other ways, culturally and value-wise. So, religion is a rather personal decision people make for themselves. So, the need to help others in their quest is absurd. Even rabbis do not help them out -- they always recommend books. They won't say you must attend services every week for your salvation. They may give you guilt by saying, why wouldn't you there last week? Evangelism is a scary business. So as long as people are actively doing it for themselves and to grow up with a strong consistent structure as I did, people may drop religion later on in life, but it doesn't mean that they forget. And if they are looking into it now for the first time, they just have to be careful not to go overboard. Even Jews who converted later on in life are crazier than those who grew up orthodox with strict structure. Have questions for Rachel? Feel free to follow up here. Or, if you have a different angle, please share it! Not long after the flood the nation of Israel came into existance. The rest of the old Testament is primarily devoted to them. There are several prophecies therein saying a virgin would have a son who would establish a new nation, not for just the jews,but for people of all nations. He was named Jesus Christ he called it his church. It is to be everlasting. When Jesus had his last meal with the apostles he told them to go to every nation and preach the gospel,teaching them every thing he had taught them. Thus we see how the onus is laid on everyone who becomes his disciple(christian) to tell about this new nation and assure it's continuity. Most disciples fail in this and some, who may be very zealous, often offend people, probably because of a lack of training.